I have always wanted to try an acorn squash, and when I finally got one, I just had to try this recipe from the Pioneer Woman. Anything with butter and brown sugar just has to be delish, and the rosemary gave it a little bit of a floral twist. The acorn squash was very sweet and tasted like candy, and after baking for around 50 mins, it was just falling off the skin. The hardest part was getting it cut open. You really need a sharp and sturdy knife. Once you get the point into the center it gets a little easier. The tough outer skin is really the hardest. Totally worth it though! **Please note I used only a half of one acorn squashes, so I only used about 1/4 of the recipe. The full recipe is below and I followed it exactly except I used dried rosemary instead of fresh. Yum! Looks like another very tasty fall recipe to try! Oh, this looks so good. 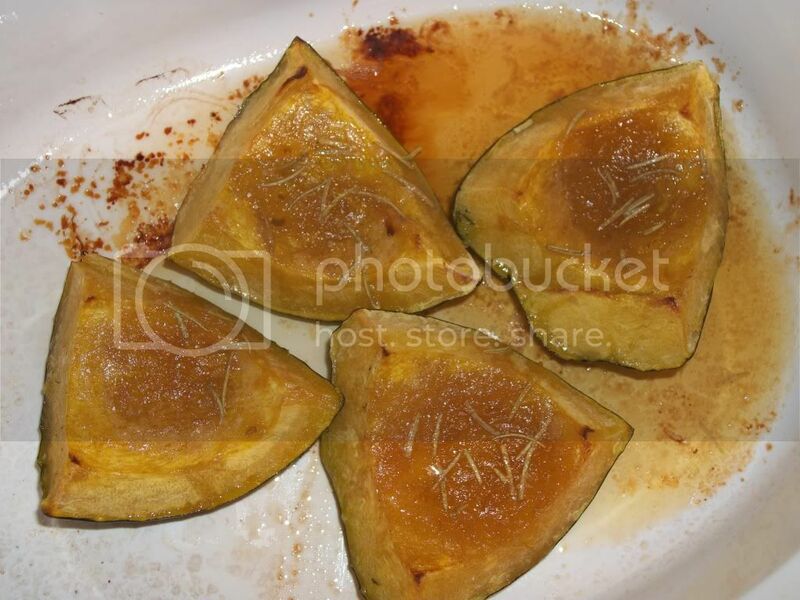 I used to do it with the squash cut in half and put in the butter and brown sugar. It was so yummy and I think the rosemary would really jazz it up a bit. Good recipe!